Alright movie fans, the day is here. The day where movies, performances, scripts, many other elements of film and the people responsible for them are awarded for their hard work and excellence. That is the Academy Awards, also known as the Oscars. They will air this evening and I could not be more excited since movies are my favorite thing in the world and in my opinion, the Oscars are the most legitimate celebration of movies. If you’ve been following our blog in the past month or so then you might know that I’ve already ranked several other nomination categories including Best Picture, Best Supporting Actor, Best Director and Best Original Screenplay. I try to rank as many categories as I can leading up to the big show but obviously I can only rank a category if I’ve seen all of the nominees. In the case of Best Lead Actor, I was waiting to see one last performance, Eddie Redmayne in The Danish Girl, and I finally did so. Now I can give my opinion on all the nominees for Best Lead Actor at this year’s Oscars. So, without further ado, let’s get into the list. First off, I just want to say that I love Matt Damon as an actor. He’s been one of the best for the past couple of decades. However, I’m not sure if I would of given him a nomination this year if it were up to me. I do think he was excellent in The Martian and he played the role that the movie demanded very very well. I just don’t think it was Academy Award level. I woud’ve like to seen a Samuel L. Jackson for The Hateful Eight or a Michael B. Jordan for Creed nominated instead of Damon. I happen to think those performances were a little bit better. I’ve been a fan of Bryan Cranston for a long time, of course as a kid watching him play the dad on Malcom in the Middle, but also the hit show Breaking Bad is arguably my favorite drama of all-time. With that being said, I was really looking forward to seeing his performance in Trumbo. I thought he was amazing in this movie and it truly makes me happy that he’s getting some recognition for his acting abilities. I think he should be a movie star based on his talent and I think that’s the way his career is headed. I do believe he deserves this nomination, however a couple more guys did a bit better than he did. I’m probably going to get a lot of ish for this but I have to be honest in my rankings. The funny thing is that DiCaprio is my favorite actor of all-time but that doesn’t mean I’m just going to think that he should win the Oscar every time he is nominated. I actually do think he is going to win but from an unbiased perspective, I think the next two guys on this list were a bit better. Leo is incredible in The Revenant and I will be very happy for him as a fan if he wins. Fingers crossed! I was in the minority last year in thinking that Eddie Redmayne would and should win the Best Actor category for playing Steven Hawking in The Theory of Everything. Everyone wanted Michel Keaton to win but Redymayne ended up taking the gold and deservingly so. I recently watched The Danish Girl and man he is such a great actor. Two years in a row he completely transformed to play a role and I just love the commitment he gives when approaching roles like this. My argument for ranking him above the other three nominees on this list is that his character was the most difficult to play out of any other character on this list in my opinion. I don’t think he has a shot to win over Leo or Fassbender but I wouldn’t be completely shocked if he did pull it out somehow. I am actually really shocked that the buzz behind Fassbender’s performance has died down over the last month or so. He was arguably the favorite to win until DiCaprio started winning at some of the other award shows and building momentum. That is why I think DiCaprio will win this but in my honest opinion, I think Fassbender gave the best performance by any actor all year. There is so much dialogue in the movie and he delivers so strongly with every line in every scene. I personally think he should win this but you know, I won’t be mad if my favorite actor of all-time (Leo) wins either. 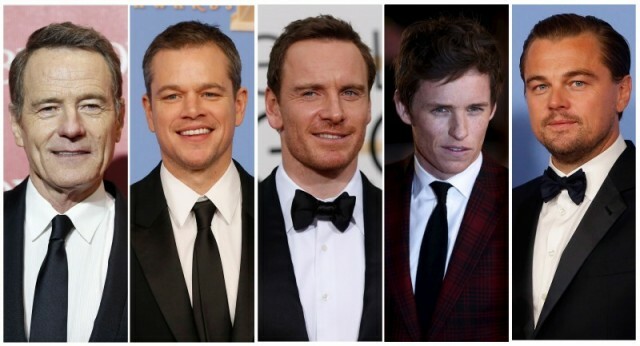 Well there are my Best Lead Actor rankings for this years nominees. I will be super excited to see who ends up winning this award, as will most people watching it. I hope you all have fun watching the Oscars tonight! Please let me know in the comment section if you agree or disagree with my rankings. Who do you think should win this category? Check out my rankings for Best Picture here! Check out my rankings for Best Original Screenplay here! Check out my rankings for Best Director here! Movie News Podcast: ‘Justice League’ Start Date Announced, ‘Pacific Rim 2’ Finds a Director!